How Does A Blower Door Test Work? A home energy audit is the first step in making your home more efficient. It is a service where the energy efficiency of a house is evaluated by a person using professional equipment (such as blower doors and infrared cameras), to suggest to you the best ways to improve energy efficiency in heating and cooling your house. But remember, audits alone don’t save energy. You need to implement the recommended improvements. Professional energy auditors use blower door tests to help determine a home’s air tightness. Energy efficiency incentive programs like the EPA Energy Star Program, will require a blower door test to confirm the tightness of the house. The test is usally performed in less than an hour. What are some of the reasons for establishing the proper air tightness? To Make sure that the home’s air quality is not too contaminated by indoor air pollution. 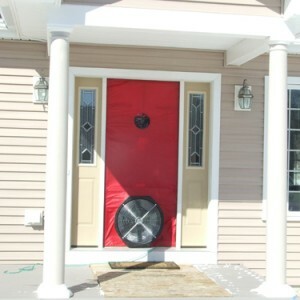 A blower door is a powerful fan that mounts into the frame of an exterior door. The fan pulls air out of the house, lowering the air pressure inside. The higher outside air pressure then flows in through all unsealed cracks and openings. An energy auditor will usually use a smoke pencil to detect air leaks. How do you prepare the house for a blower door test? Contact LIPA to see if they offer free or discounted energy audits to their customers. If not, you can hire a home energy professional, such as a certified Home Energy Rater, to evaluate your home’s energy efficiency. Remember: The Earth is what we all have in common!